Hearst Castle in San Simeon, California attracts millions of visitors a year. The magnificent former home and playground of newspaper publisher William Randolph Hearst is an amazing and over-the-top mansion with an indoor swimming pool, gold fixtures, movie theater and lush grounds. But visitors to Hearst Castle owe it to themselves to drive just six miles south to the artist’s colony of Cambria. There’s another architectural wonder there that’s beyond belief. It’s called Nitt Witt Ridge. No, it’s not a glamorous name, and for good reason. Because while Hearst Castle is dramatic, sprawling and elegant, Nitt Witt Ridge is just plain…weird. 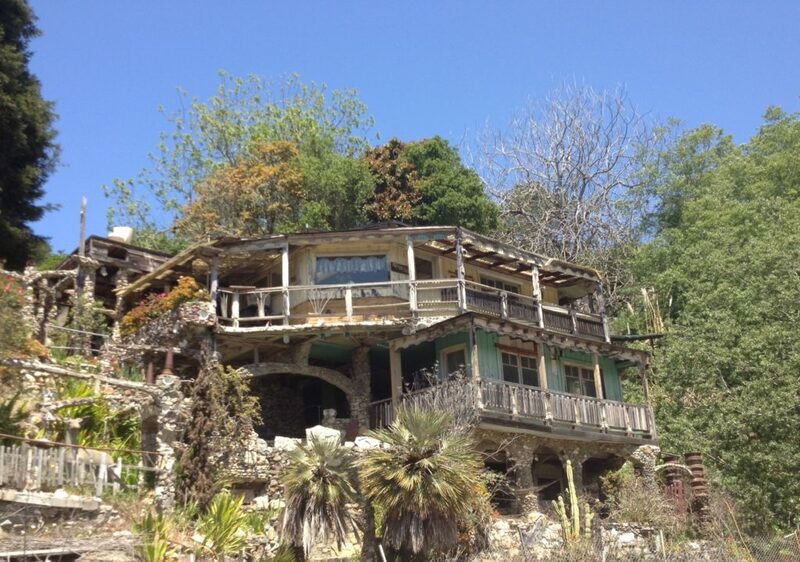 The three-level home was created by one man, Art Beal, over the course of 50 years, beginning in 1928. He cleared the land himself with a pick and shovel. He called them “idiot sticks” because he said anyone could use them. Beal swam with “Tarzan” star Johnny Weismuller, placed second to Charles Atlas in the Mr. Universe contest and was a bodyguard for singer Linda Ronstadt. He put his muscles to good use on Nitt Witt Ridge. He built the property with objects he found – scraps of tile, beer cans, car parts, toilet seats, wood, rocks, seashells, TV antennas. It’s a folk-art structure that defies belief. How did he do it? More importantly, why? It seems Beal had two passions – collecting and building. He combined them to create the home. He was often called a nit wit (or worse) so he named his creation, built on a slope in the hills, Nitt Witt Ridge. The two and one half acre site is now owned by Michael and Stacey O’Malley. They happily offer 45 minute tours by reservation only. During the tour you’ll learn about Art Beal, walk through the house and grounds, see a video of Beal at work on the property and see some of his personal belongings. The place is now California State Historic Landmark #939. 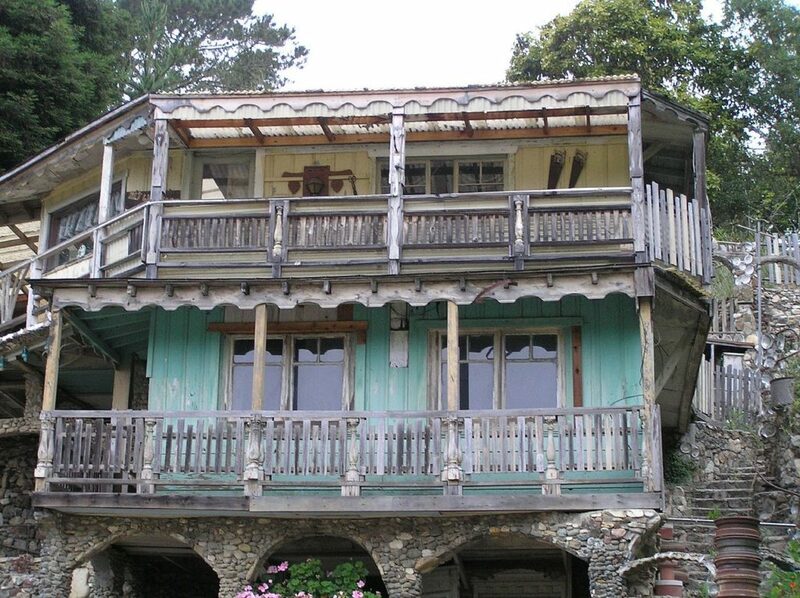 It’s located at 881 Hillcrest Drive in the West Village section of Cambria. The village of Cambria is well worth a visit anyway and you might want to stay there instead of opting for the pricier hotels/motels of San Simeon. There’s a great arts and crafts feeling to the village, with lots of shops and gorgeous ocean views. And a visit to Nitt Witt Ridge caps it off. To arrange a tour call 805-927-2690. Even if you aren’t able to take a tour, it’s well worth driving by and parking to look at the property from the outside. Crazy? Yes. But crazy in a good way.